Taking your Golden Retriever along with you on trips to the waterside can be a fun and enlivening experience. Many of these beautiful dogs can be great companions and will enjoy participating in various kinds of outdoor activities with you. To make happy memories together and avoid unnecessary risks on the water, it is a good idea to equip your pet with a dog life jacket. 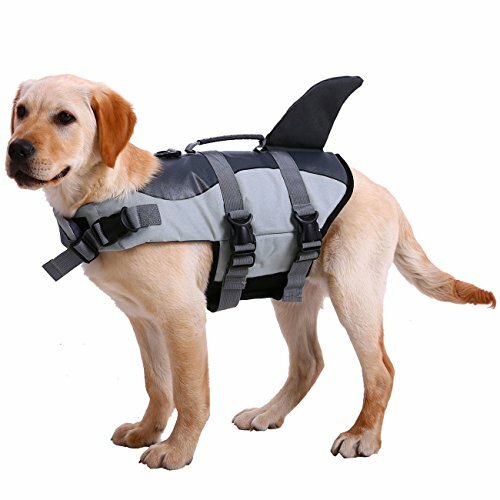 You can find a range of dog life jackets in the market, including some amusing types that are shaped like a shark’s fin or a mermaid’s tail. 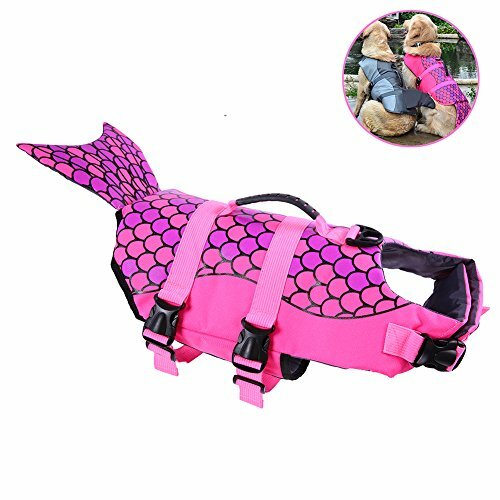 Like human life jackets, dog life jackets come in bright colors to make them easily noticeable while your pet is in the water. Do All Golden Retrievers Love To Swim? Golden Retrievers were bred from dogs– like water spaniels and flat-coated retrievers– that were traditionally used to retrieve fowl from the water. Thus, many people assume that Golden Retrievers are natural-born swimmers. The truth of the matter though is that all Golden Retrievers may not have an innate liking of getting themselves wet. Like us, dogs are individuals, and have their own personal likes and dislikes. Some Golden Retrievers will take to the water with great enthusiasm, while others will balk at dipping even the tip of their paw. The environment they have been brought up in also makes a major difference. If you have accustomed your Golden Retriever to being in water from puppyhood, they may take a more positive view of it. 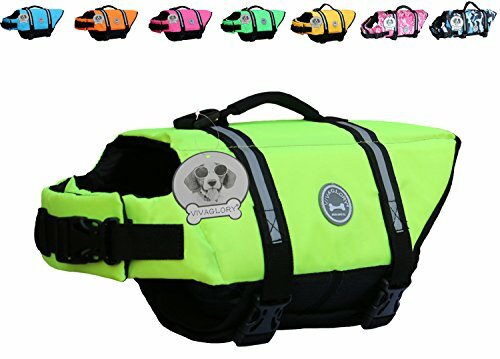 Whether your Golden Retriever enjoys being in the water or not, a dog life jacket is a must if your pet is going to be with you when you go swimming, rafting, boating, sailing, kayaking, canoeing, or paddle boarding. 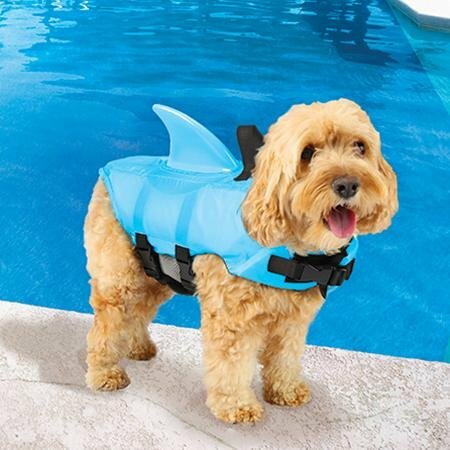 Some dogs may resist being forced into a life jacket out of the blue, so get them accustomed to wearing it in a gradual manner. Put on the dog life jacket when you take your Golden Retriever out on walks (the dog life jacket can double as a snow coat or a raincoat) or have the dog wear it around the house for a few hours. Let your pet get so used to having the life jacket on that they stop even noticing it. 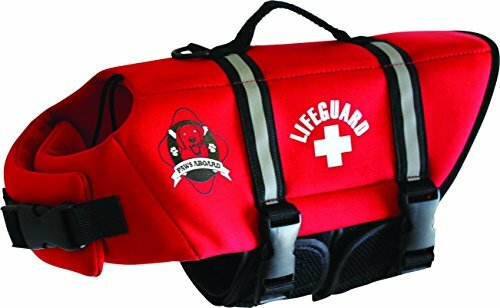 When you go to the waterfront, offer your Golden Retriever treats to go into the water wearing the dog life jacket. Your pet will soon realize what a help the life jacket is to remain in the water for extended periods. The foremost reason to use a dog life jacket is for your pet’s safety. A life jacket is an essential item for a dog that is going to accompany you on the water. You can’t keep a watchful eye on your dog at all times, and you don’t want to take the chance of an accident happening if your dog should slip overboard. With a dog life jacket on, you can rest assured that there will be no question of your pet drowning if they fall into the water, and that in the event something untoward happens, your dog will be spotted at once and rescued. Due to age, health, and temperament reasons, all Golden Retrievers are not good swimmers, and they will appreciate having a dog life jacket to assist them in keeping them afloat in the water. Even strong canine swimmers can tire out, and a life jacket will come in handy until they can regain their breath and energy. Some dogs are nervous about going into the water but may gain confidence from wearing a dog life jacket. Once they realize they are not going to sink and drown, they will be able to relax and enjoy their time in the water. You may even have trouble dragging them out when it is time to go home. Golden Retrievers that work in search and rescue operations on water bodies need to be fitted with dog life jackets to protect them from cold water and to keep them safe in the course of their work. Is your dog small-sized, medium-sized, or large-sized? Is your dog light-weight, medium-weight, or heavy-weight? 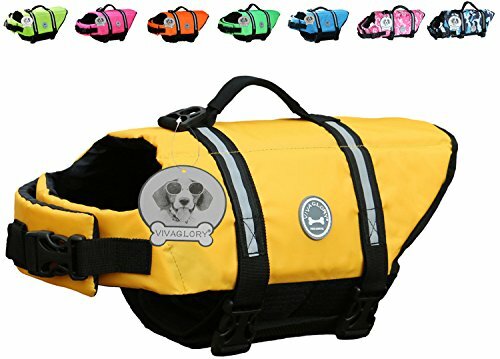 You need to factor in size and weight to decide if you should get a small, medium, large, or extra-large dog life jacket. Can the dog life jacket be adjustable to a certain extent to match your dog’s measurements? You may not always get the exact fit for your pet’s size and shape, so it’s good to have a life jacket that allows for adjustments. 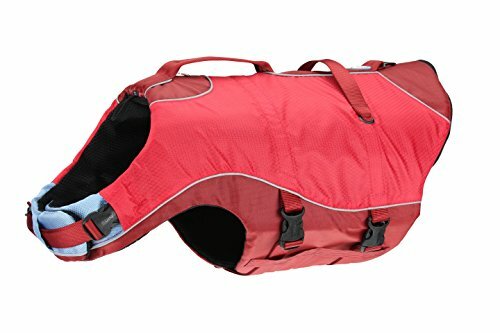 Is the dog life jacket a comfortable fit for your pet? Make sure it does not rub anywhere and get abrasive. Can your dog move, sit, or lie down without any restriction when wearing the dog life jacket? Your dog is not going to like wearing the life jacket otherwise. 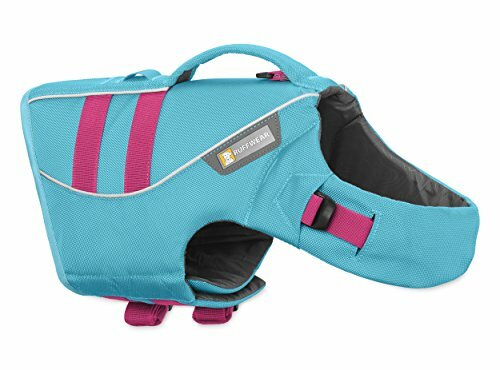 Are the life jacket buckles and foam padding placed in positions that don’t hamper your dog’s movements? 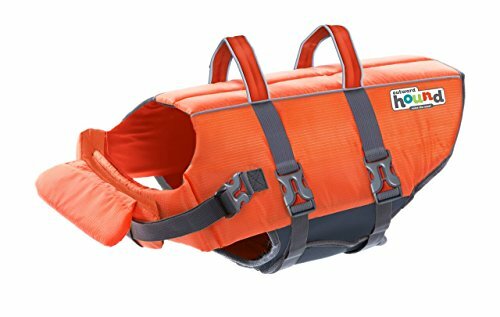 Does the dog life jacket have a neck float to keep your pet’s head above water at all times? 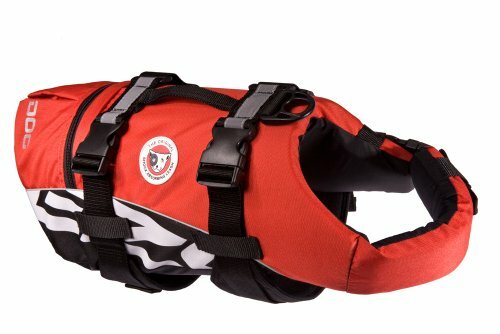 Does the dog life jacket have a metal ring for attaching a leash? This is useful for when you walk your dog on land, or when you need to tug your pet in the water. Is the dog life jacket made of strong and durable material? Nylon is commonly used for dog life jackets. 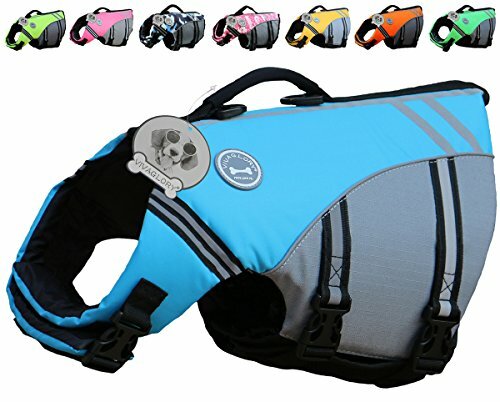 Does the dog life jacket have strong handles and straps that will take your dog’s weight and give you a good grip when you need to steer your dog in the water or when you have to pull your dog out of the water? 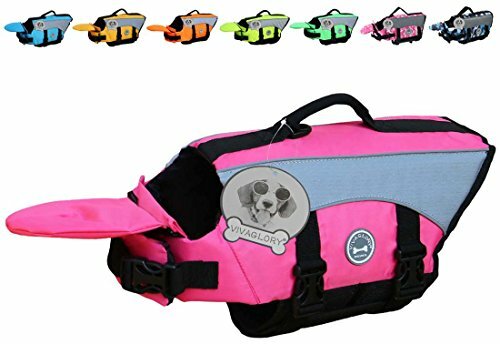 Does the dog life jacket have bright colors and reflective lining that will make it easier to not lose sight of your dog in the water? Some popular bright colors are pink, red, orange, yellow, blue, fluorescent green, lime green, and silver. Take a tape and measure your pet’s chest girth. Use the tape to measure your pet’s neck girth. While your dog is in the standing position, measure the length of your pet’s back from your pet’s neck base to the base of their tail. Compare these measurements to those of the life jacket and buy the one that fits or is a close approximate. 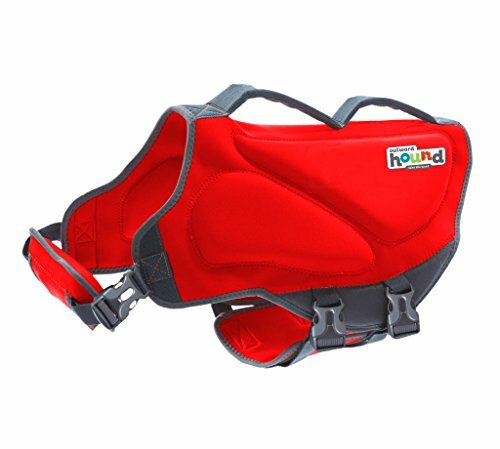 Most dog life jackets allow for some amount of adjustment to custom fit your dog. Certain dog breeds like the Chesapeake Bay Retriever, Labrador Retriever, Newfoundland, Poodle, Spanish Water Dog, Otterhound, Cocker Spaniel, and the Irish Water Spaniel were bred to be working dogs that fetched and carried hunted birds and animals from water. These dogs have a high level of endurance and thick coats that offer a measure of protection from the cold water, and, although these dogs may no longer be used as widely for hunting purposes, they are said to have a strong affinity for water. You may find it easier to coax them into the water and train them to swim as compared to some other dog breeds. As mentioned before though, the environment in which the dog has been brought up also plays an important role in how well your pet takes to water. All dogs that venture into water can benefit from dog life jackets, and this is particularly important for service dogs and search-and-rescue dogs. A good dog life jacket is a must if you and your dog are going to spend a significant amount of time on the water. It will keep your Golden Retriever safe from the risk of drowning, and your pet will be happier and will feel more secure as they swim in the water. You will also be more at ease knowing that your pet is well-protected and can be rescued quickly in case of an adverse event.